Chameleons can live long healthy lives with proper care. Supplying your pet with a clean cage, the correct habitat, and nutritious foods helps ensure your pet remains healthy. Unfortunately, even with the best care an illness or injury may arise. 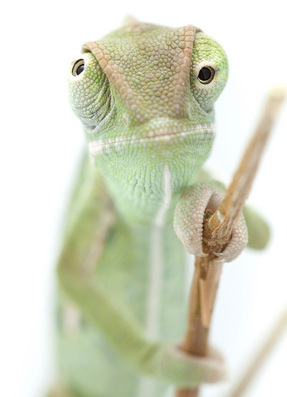 It is always recommended that you seek advice from a veterinarian if your chameleon becomes ill or injured. Below is a list of some of the more common problems that can affect chameleons. Insufficient calcium, vitamin D3, or too much phosphorous can cause your chameleon to have deformities in the legs and spine, soft bones and jaw, a loss of appetite, weight loss, and lethargy. Providing your pet the correct foods, UVB lighting, and supplements will help prevent this disease from occurring. Dehydration can be caused by a lack of drinking water and humidity. Signs include dry or wrinkled skin, weakness, weight loss, and inactivity. Edema is a swelling in the body caused by excess fluid. Chameleons tend to swell in the throat, neck, and chest. One of the more common causes is over-supplementation of vitamins. Always supplement your pet’s food in moderation. Too much of a good thing is as bad as none at all. Egg binding is when a pregnant female is unable to lay her eggs. It can be caused by a lack of calcium, lack of water, a poor nesting locations, or some other factor. Making sure a pregnant female receives the correct amount of dietary supplements can help prevent binding. Providing a good substrate where she can dig a suitable nest to lay her eggs is also beneficial. Gout is when the joints of the legs and back get inflamed. It is often caused by a lack of humidity or drinking water. Minor injuries like cuts and scrapes from accidents may occur. Minor injuries can be treated with soapy water and antiseptic ointment. Keep an eye on an injury to make sure it heals and for signs of infection. Major injuries like a broken limb or tail will usually require treatment from a veterinarian. A chameleon’s mouth is susceptible to infection which can cause loss of appetite, inability to feed, swelling, scabs, and cheesy pus. Supplying additional vitamin C as well as normal supplements may help the problem but a veterinarian may be necessary. A respiratory infection can cause lethargy, appetite loss, gaping, and trouble breathing. Respiratory problems can be caused by cage temperatures that are too low or some other underlying problem. Sometimes chameleons will have a bad shedding where there are flaky pieces of skin and excessive shed. A light misting of your pet can aid in the skin removal. Ongoing problems with shedding can be caused by dehydration, a vitamin deficiency, or an illness. Sometimes a chameleon will injure its tongue and won’t be able to retract the tongue into its mouth. If this occurs, you will need to make sure the tongue remains moist and does not dry out while it heals and that your pet remains warm. A tongue can also get an infection. Signs include loss of appetite and very little or no use of the tongue. Antibiotics are usually needed to treat the problem. A vitamin A deficiency can cause teary and crusty eyes, respiratory problems, shedding problems, and lethargy. Providing your pet with multivitamin supplements and gut-loading his insects with nutritious food can help prevent a deficiency.